I went to see Rowdy Rathore last night and enjoyed it, but you’ll have to wait for my review while I scramble to collect coherent thoughts. Instead, I bring you this post that’s been in the making for probably two weeks. Unfortunately, my journey with my favorite jodi, SRKajol, has very reluctantly come to an end. Finally, after more than a year of putting it off (and watching it in snatches over the course of six months), I finished Baazigar. Part of me had so wanted to see Baazigar because it was the last of the SRKajol films left to watch while it was also their first film together. But part of me didn’t want to because it was the end of the line. The SRK and Kajol of Baazigar are very different than the SRK and Kajol of other films. In 1993, both were fairly new to the scene and certainly not huge impressive stars, and Kajol was barely (if at all) a legal adult. The roles for each are unlike their other films together. Despite romancing two women, Shahrukh isn’t the lover boy; he’s a cold murder bent on revenge, a dark role at which he’s surprisingly, perhaps frighteningly, adept and convincing (see: Don, Don 2, Asoka, Duplicate [in one of his roles], and even Josh to a degree). Priya Chopra is less boisterous than the typical Kajol character we all know and love (though she’s clearly excitable and bouncy), and she’s grappling with the mysterious suicide of her older sister, while being the spoiled rich girl (isn’t that usually SRK’s job in their films?). While part of me melted at the notion that Ajay (SRK) could easily kill Seema (Shilpa Shetty) but not Priya (Kajol) because he loved her (something that maybe only SRK and Kajol could ever make legitimate), there’s something inherently disturbing about the fact that Priya is able to forget Seema’s murder because she loves Ajay. Priya begins with a sort of shocked desire for avenging her sister’s death, or at the very least forcing Ajay to admit to it (and sending him to jail). By the end of Ajay’s sob story, she seems more at a loss, drawn into sympathy for him. And when he dies in front of her face, she cries for him — not for her father whom Ajay just killed. SRK with Shilpa Shetty (above, with TOTAL 90s hair) vs SRK with Kajol (<3). While we’re on that, let’s talk about how twisted this film’s sense of justice is. The basic plot is that Madan Chopra worked for Ajay’s father, Vishwanath Sharma. While Sharma was away, Chopra took over his company and tossed his family out on their backsides with absolutely nothing. Eventually this leads to Sharma dying in shame (in the middle of the street on a rainy night) and then his daughter dying in Ajay’s arms. Ajay’s ma is then emotionally dead; she doesn’t speak or acknowledge anyone for years. So Ajay plots his revenge on Chopra’s family. In disguise, he courts Chopra’s oldest daughter Seema and kills her, making it look like a suicide. He then kills one of Seema’s (male) friends along the same lines. Later, he murders another of Seema’s friends and stuffs her in a suitcase, dumping her into the bay. Ajay's gonna go kill some people now. And if you’ve already lost track of the body count, then you’re in trouble. Because the climax of the movie is one giant bloodbath — that is surprisingly bloody and graphic for Bollywood — in which he slays several of Chopra’s goons. Some of their deaths are particularly gruesome, like when he bashes heads through windows (and the glass sticks in faces). And then after being impaled by Chopra with rebar, Ajay kills Chopra by hugging him and impaling him with rebar after jumping off a building. But the end result of this? Ajay dying contentedly and satisfied in his mother’s arms, having woken her from her stupor and avenged his father and sister. If I remember correctly and didn’t miss anything, it’s unclear whether he ever meant to kill Priya, but he certainly hurt her family — left her a sisterless orphan, as a matter of fact — and she’s standing by crying at his death. So, effectively, even though Ajay isn’t allowed to live on unpunished as a murderer, he’s still very much the sympathetic hero, legitimized by his love for Priya and even more by her inexplicable love for him. Despite the fact that he is an utterly cold ruthless killer, I wouldn’t even call him an antihero because we don’t get to feel satisfaction from his not winning. Instead we cheer for him to murder Chopra at the end. In that way, Baazigar kind of fascinates me. It’s certainly a dark revenge film and the coldness of Ajay’s expressions when he kills is terrifying, but in essence, the film uses family to ultimately legitimize his case (while ignoring family as a legitimate excuse for Priya or her father). Talk about a slippery slope. 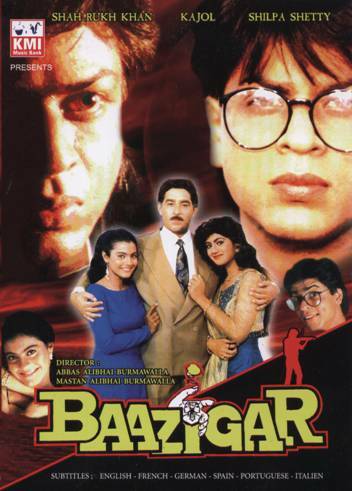 So, despite the end of the SRKajol saga for me, and the bloody surprise of this movie, I’m very glad I watched Baazigar. Im Indian, and I watched this movie when I was five. I remember telling my shocked aunt and mom after watching the film that I would do the same to someone who acted unjustly. So this is not a "revenge" film, in the truest sense, the movie is about justice. Ajay and his family were good and nice people, who lived without stealing, and Madan Chopra, lied to them , took advantage of their kindness and cheated them out of what was justly theirs. At the end of the movie, Kajol understood that her father, his wealth, their status in society, all of it was a monumental farce built of someone else's grave. Of course, she cannot forget her sister's death, but as a good and just person, she understood that Ajay was too far gone and all of his actions in the end were caused by her father. The Indian veiwer looks at Madan Chopra as the reason for all the "Evil" in the movie. SRK just did what he had to.
" the film uses family to ultimately legitimize his case (while ignoring family as a legitimate excuse for Priya or her father)"
Thats like saying that a Court uses Justice to legitimize their case in sentencing a criminal, while ignoring that a honor killing is also based on justice. Well, I think revenge and justice are interrelated, perhaps even two sides of the same coin. Revenge is taking justice into your own hands because you don't think anyone else can properly serve justice. I hope this isn't overstepping, but I think the two are probably even more closely related in India considering the less than desirable state of the legal/justice system. And I don't think it's wrong at all to say that family legitimizes Ajay's case. If you strip away everything else, we'd all say that Ajay killing Seema and then Madan is wrong. BUT when you add in the factor that his family was wronged by Madan, he has a legitimate reason to kill. And also, a person's crime absolutely legitimizes or validates a court's punishment for them.